" Whole Person Medicine that Emphasizes Health and Wellness ..."
Cardiovascular disease is the number one cause of death in the US. It involves not only ailments of the heart, but the arteries as well. Having a healthy heart is not only a sure fire way to live a longer, richer life, but it can also reduce the chance of other afflictions such as a stroke. Here are a few tips to adapt into your everyday life, on your own, or with the help of a medical specialist. Limit the amount of saturated fat (typically found in red meat and dairy products), trans fat (found in anything that includes the term "partially hydrogenated" in the ingredients), and cholesterol you consume. Eat more low fat proteins including fish high in Omega-3 such as salmon and mackerel. Omega-3 is known to decrease the risk of heart attacks and lower blood pressure. In addition to fish, it can also be found in supplements derived from flaxseed oil, walnut oil, soybean oil, and canola oil. Decrease the amount of sodium in your diet. Limit your portions. This one may be the simplest and yet the hardest, but can be accomplished by limiting the time you spend dining out, putting less on your plate at home, and avoiding second helpings. Proper exercise goes hand in hand with a healthy diet, and many researchers have provided the math to back up these claims. Get tested by a health professional. 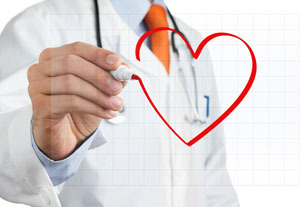 When trying to prevent heart disease, the best approach is a proactive one. Regular testing of your blood pressure and cholesterol levels can pinpoint areas of concern before they become a serious problem. Smoking is already known to cause certain forms of cancer, but it is also a detriment to the cardiovascular system. The chemicals found in tobacco not only damage red blood cells, but blood vessels as well. Copyright © 2014 New York Center for Progressive Medicine. All Rights Reserved.